The Optoma ML330 projector is a smart Android projector providing high definition big screen entertainment in any room in your home or office. Conveniently stream content from popular apps such as Netflix without the hassle of connecting a Blu-ray player, media box, dongle, smartphone or tablet. With built-in WiFi and integrated Android this LED compact projector is hugely versatile. Weighing only 460g you can take the portable ML330 virtually anywhere. Perfect for a movie marathon or gaming night - you can even use it as a business tool to deliver engaging presentations using Office and PDF viewer apps. 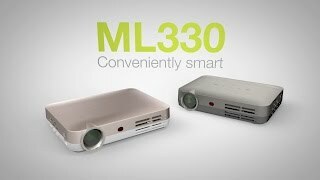 The Optoma ML330 Android portable projector offers 500 lumens, Bluetooth, HD, LED, DLP, Wifi, , MS Office, PDF viewer, Ethernet RJ45 and weighs 0.5kgs. It comes with a case, auto keystone, screen mirroring for your phones, tablets and laptops and is perfect for home, business or even gaming on the move. This LED compact projector is hugely versatile. Weighing only 460g you can take the portable ML330 virtually anywhere. Perfect for a movie marathon or gaming night - you can even use it as a business tool to deliver engaging presentations using Office and PDF viewer apps.